There are a variety of ways and different tools that you can use to make a mortise. While each has their advantages and disadvantages, if you want to create top quality mortises that fit and look highly professional - A dedicated mortising machine is the only way to go. There are multiple benefits to owning a benchtop mortise. Unlike a router or chisel, a mortising machine will force out the waste and square the cut in one simple and fluid operation, leaving ends that (should) pair perfectly with your tenons. 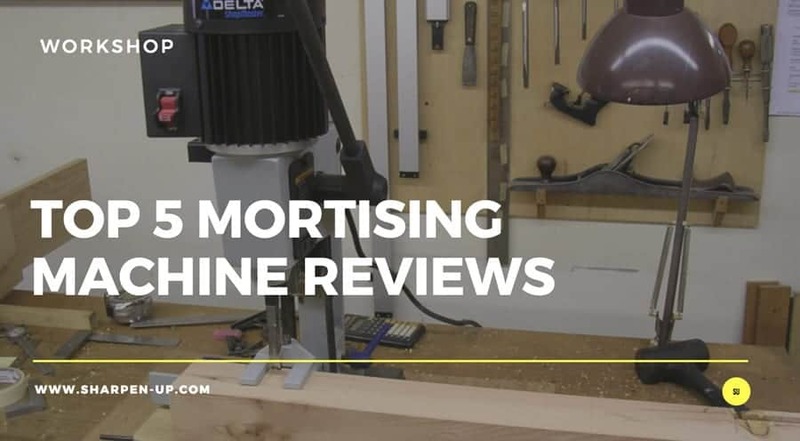 If mortises are big part of your woodworking operation, the level of speed, quality and efficiency you will gain from using a dedicated machine simply cannot be beaten. 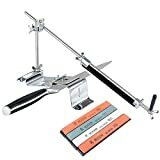 So what is the best mortise machine you can buy in 2018? This is exactly what we have tried to answer in our mortise review round up. The table below shows our top picks. For in depth analysis of each and lots more helpful info, keep on reading. 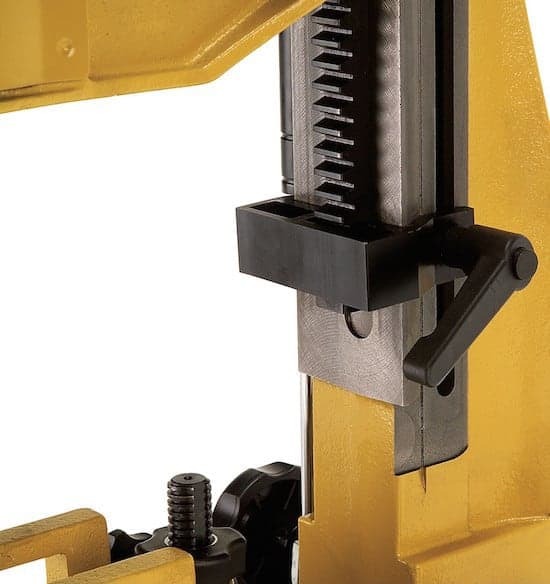 The Powermatic PM701 bench mortiser gets the top spot in our review roundup for a number of reasons. Essentially the Powermatic balances, power, price and a wide range of features, in one high performance tool. Powering the PM701 is a 3/4-horsepower motor (running at 115 volts) that can operate up to 1,725 rpm. This is above par for benchtop mortisers of this size and price range. The head-stroke capacity is great too. Coming in at 5-1/2-inches with chisel center to fence dimensions of 4-3/8-inches and a chisel capacity up to 3/4-inch. To say that the Powermatic can handle a wide range of jobs is an understatement. It really is one of the most versatile benchtop mortisers currently on the market. Another great addition that makes the Powermatic really satisfying to use is the specially designed double lock system. This ensures that the stock is held down fast while you work. One lock fixes the stock from the side while, the other locks from the top. Now matter the drill bit size or depth of wood, the problem of stock sticking to the chisel is more or less eradicated on this tool. Whatever your preferred method of operation, or the requirement of the particular job, the reversible handle on the Powermatic makes the machine extremely versatile. Furthermore, to change the handle from side to side is quick and easy to execute, without the need of any special tools. The handle is also well built and sturdy, while offering a good firm grip. This is a machine that will keep on working for many years. The easy to use action cam lock makes positioning the fence extremely painless over a 90-degree movement. It is simply adjusted by an ever-reliable rack and pinion system. A large hinged chuck door with a well thought out magnetic catch allows you easy access to the drill chuck. A standard 4-inch chuck key is all you need there too. The large surface area that you get to work with on the Powermatic is another big selling point. The table size of the mortiser is 11 by 13 inches – an excellent level of space for a benchtop. Other vital statistics include a fence size of 2-5/8 by 12-1/2, with an overall base size of 16-5/16 by 13-3/4. Easy to use with innovative features such as the reversible handle, versatile fence system and simple to access chuck. A slight design flaw in the handle can make it uncomfortable to use in some configurations. 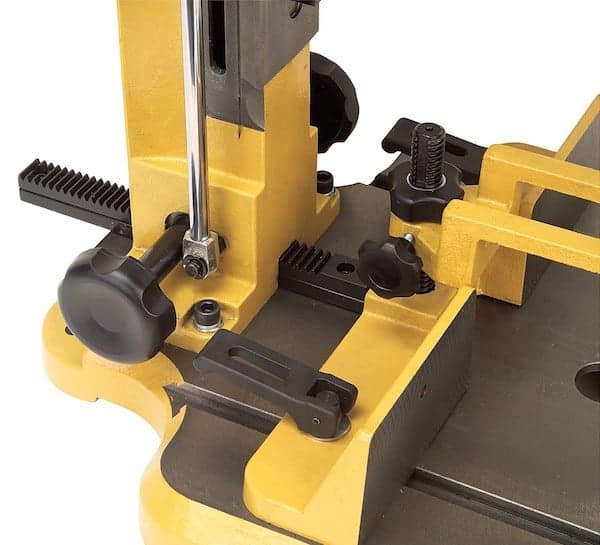 Some users have experienced the handle bottoming out on the table before the desired chisel depth is reached – therefore to get around the problem, an uncomfortable starting position has to be set. 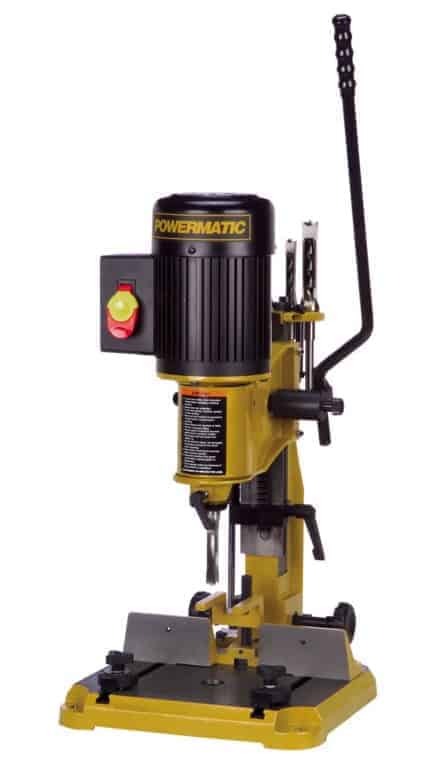 There are lighter models on the market – the Powermatic weighs in at 93 pounds. However, if you do not plan on moving your tool around a great deal – this extra bulk makes for a studier machine. The pros significantly out number the cons with the Powermatic PM701. A well designed and engineered benchtop mortise machine that really will revolutionise the way you work. In our opinion this remains the best mortiser available in 2018 by a long margin. 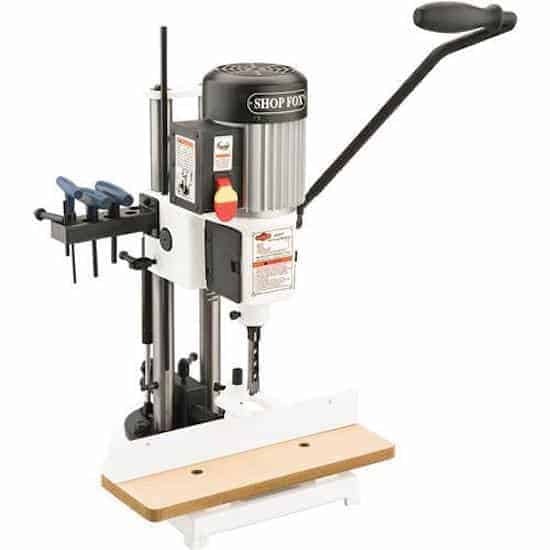 The Jet JBM-5 bench mortiser is a great option for professional furniture makers and home woodworkers alike. The relative lightweight design, (just 44 pounds on this machine) makes it an ideal addition to a small workshop, with easy manoeuvrability to boot. 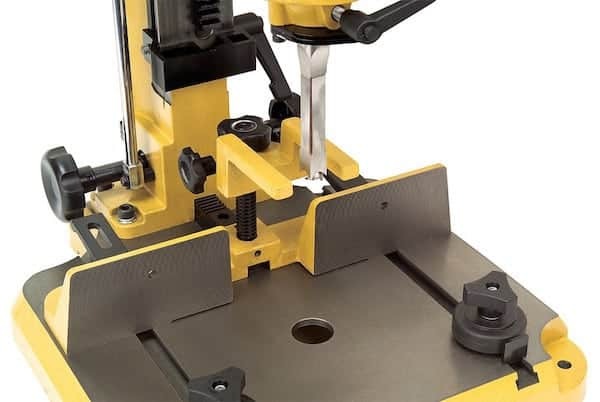 Enhanced versatility is also gained by the fact the machine reverses on its base to allow for mortising long stock - a great feature for the home workshop. Lets see how the build quality and performance stacks up however. The Jet JBM-5 features a 1/2 HP TEFC 1725 RPM motor. 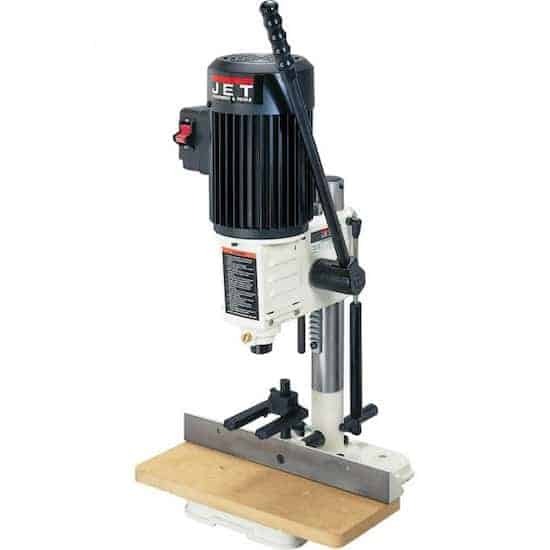 While not quite as powerful as the Powermatic, the Jet still offers a solid level of performance on most stock types, (however some users have complained that the tool is underpowered on slabs of thick wood). 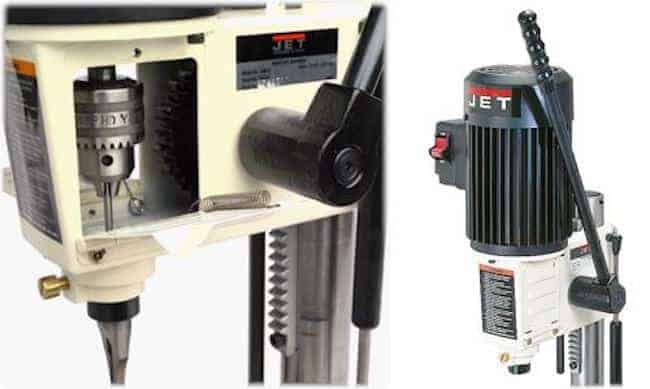 Offering a 1/2" maximum mortise chisel capacity, on top of a 4-3/4" head stroke, (on a rack and pinion head system) it is clear to see that the Jet is designed to accommodate a wide range of mortising tasks. Like all good benchtop mortisers, the feed handle is easily adjustable allowing the operator to choose the most comfortable position for each application. 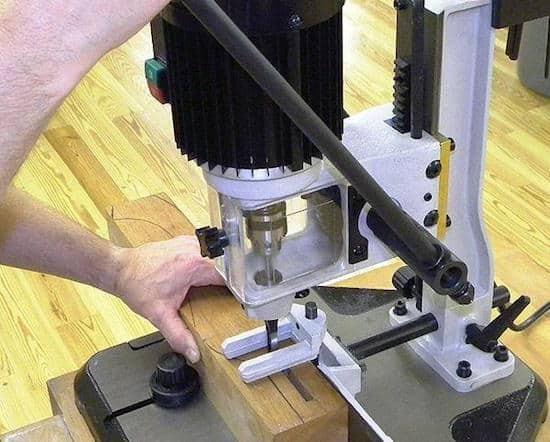 The quick setting depth stop allows for that much needed accuracy when it comes to creating your mortise in all types of wood. Bits are very easy to change on the Jet. Just flip a steel door on either side to gain easy access to the chuck. 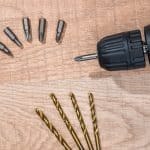 A three-jaw drill chuck with extended 4-inch chuck key, gives the positive grip that you need when changing over drill bits. Despite the lightweight design, the heavy-duty cast iron and steel construction provides a pleasing level of robustness, while ensuring strength and durability for many years of use. 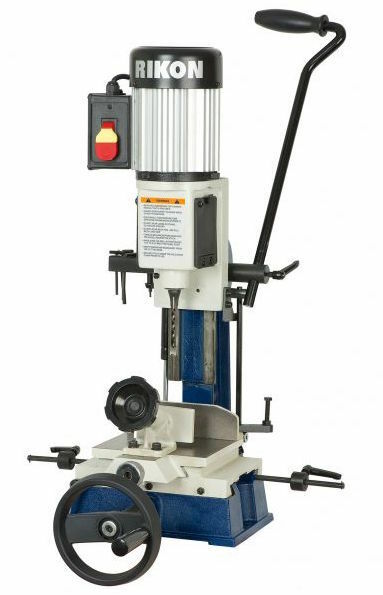 The machine is set on a cast-iron base with four predrilled mounting holes for enhanced stability. The aforementioned reversible column for mortising larger stock is a great feature on the Jet JBM-5. As too is a very generous 5 year limited warranty. 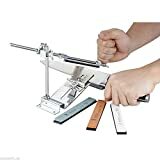 At the time of writing the machine includes everything you need for instant mortising, with 1/4", 3/8" and 1/2" chisel and bit sets included with the sale. Working with the thicker stock can put pressure on the slightly under-powered motor. The Jet is a great intermediate mortising machine. Lightweight and easy to manoeuvre this is a good addition to the home workshop. However, the slightly under-powered motor (for more heavy going tasks), and less than stellar fence dimensions, mean there are better options out there. 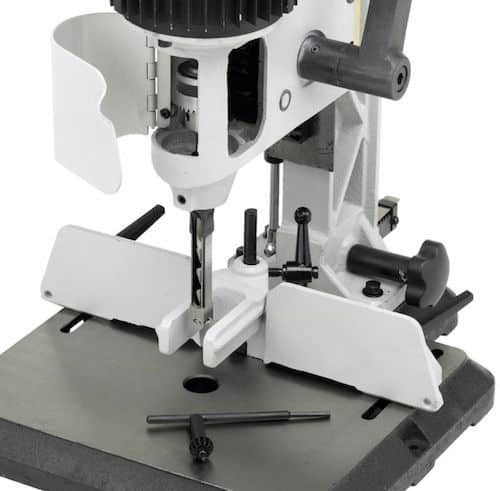 The Shop Fox W1671 is a well-built mortise machine that has some nice features deserving its position in our top 5-list. In fact, Shop Fox have gone for a system that can handle all manner of bench operations with the W1671. They have incorporated a unique swivelling base construction that allows for off bench versatility, opening up new possibilities for custom mortises. The extra height and depth capacity of the machine also allows you to work with large stock. Overall build quality is evident in the superior materials and a satisfying 94-pound bulk total. Considering the machine has been designed to cater for all wood types, there’s no surprise that a good- sized motor exists under the hood. At the core of the Shop Fox W1671 is an aluminum-finned, single phase high powered, ¾ Horse Power motor. Strong enough for most tasks, operation is further assisted by a gas spring return system and double support columns with a Jacobs’s taper number two spindle. An all-steel construction depth stop, complete with easy to operate adjustments, help provide that much-needed level of accuracy and performance. The Shop Fox includes a 22-Inch long solid steel quick-positioning handle, which again offers the extended leverage that you need when working with thicker materials. A sturdy micro adjustable fence does a good job of eliminating wood movement. Not quite in the same league as the Powermatic double lock system in that regard, but still a superior system when compared to the competition. The clue is in the name, the Shop Fox is a heavy-duty beast that really can handle the big jobs. Despite the heavy-duty construction, some of the finer details lack overall build quality, (mostly due to sub-par manufacturing) which can lead to frustrating results. Piecing the unit together on arrival has caused some users a big headache. Instructions are out-dated and bits are occasionally miss-shipped. On paper the Shop Fox is a good, robust mortise machine that can handle a wide range of jobs. However, the minor issues in manufacturing quality control, make for a tool that does have some idiosyncrasies. Whether you can look past these will be a determining factor of this being the right machine for you. The RIKON 34-260 bench top mortiser is another great machine with a long list of high quality features. One nice addition is a gas filled stabilizer. This aids control of the downward and upward chisel movement as you work. There’s also ample work surface space provided by the X - Y directional table, (and 2 x table extensions). The innovative design of this offers excellent positioning control for boring your mortises. Rikon have opted for a mid range powered 1/2HP, 1700RPM motor to reliably deliver the juice for your cutting needs. While it doesn’t provide the same level of force as the Powermatic or Shop Fox, this is still an adequate motor capacity for most mortising. There is also a well built, dovetail column ways (with adjustable stop) for all-important consistency when cutting multiple mortises. The chisel shank diameter comes in at 1 inch, with 5/8" and 3/4" brushings. Shank range is a more than operable ¼ inch to 5/8 inch inclusive. The design of the machine incorporates a simple chisel Stroke of 4 ¾ inches. The maximum height under the chisel is 5 inches. Moving onto the chuck. 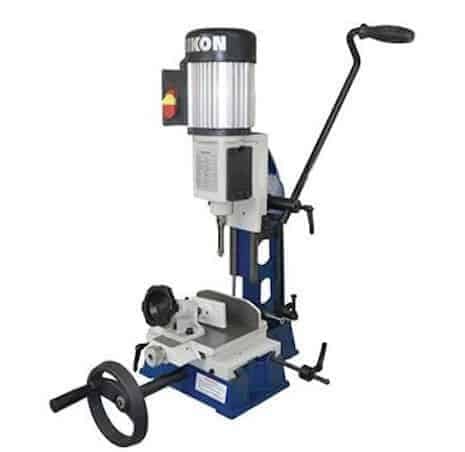 The Rikon offers a ½ inch chuck capacity, with a maximum clamp/hold down width of 3 7/8 inches. Fence support is good with dimensions measuring in at 13 ¾ inches in length and 2 5/8 inches in height. The material used in the construction of the fence is strong enough to withstand prolonged use. The RIKON is a very well made piece of kit with some fantastic features and overall top level performance. A highly recommended benchtop mortimer. The final machine to make our top 5 mortimer reviews list is the 14-651 from Delta. This has proved a popular Mortimer machine with customers, one of the main reasons being it is easy to install and operate from the get go. Despite the simplicity, it remains a tool focused on the serious user with the onus being on professional results. A 1/2-horsepower, 120-volt, 60-hertz, single-phase induction motor is at the heart of the Delta, providing a steady stream of power for each and every job. The machine has a feed speed of 1,725 RPM and also features a multi-position, adjustable feed lever. An adjustable depth stop is there too of course. This locks down for precision cutting to enable consistent results. 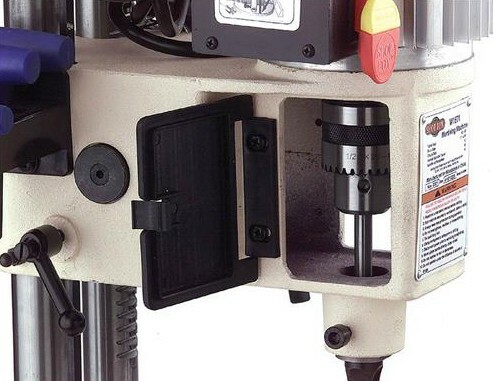 The rotating mortising head is excellent for tricky off-table projects, and a real bonus feature of the Delta. Furthermore, it is in no way complicated to set up or adjust. A height attachment increases the mortiser's capacity by 1-3/4 inch. Should this not be enough, you can simply turn the 14-651's head 180 degrees to mortise off-table. The sturdy lever has a lock down operation, and is long enough to provide the leverage required for mortising the hardest of woods. Weighing in at 77 pounds, the Delta is actually a little lighter than the likes of the Powermatic and Rikon. However, the robustness is still there with the heavy-duty 16-3/4-inch by 13-1/2-inch cast-iron base providing excellent stability to the entire machine. That being said, many customers have complained that attention to detail is lacking in the manufacturing with the Delta seemingly poorly put together, with what have been cited as lower quality components. Very versatile with the extended head height, as well as the rotating capabilities. The unsatisfactory build quality that some users reports, means you could experience problems if this is a tool you plan to use extensively. 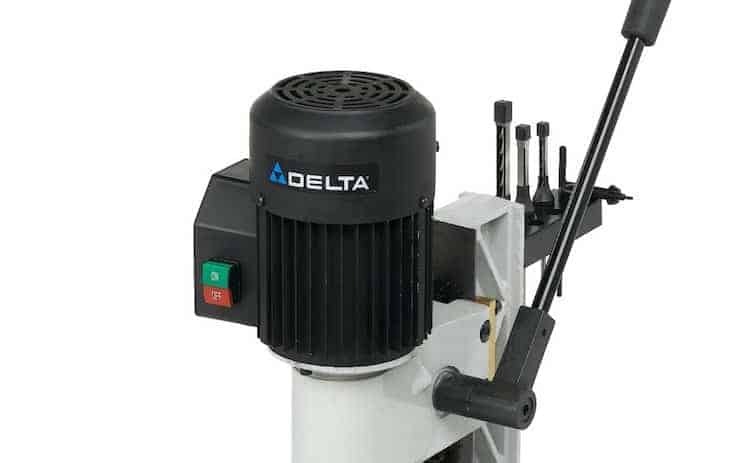 While the Delta undoubtedly has some good points with its various features and superior versatility of the rotating head, the fact the overall build quality is lacking means this is a mortiser machine with problems. Some customers have been more than happy with the results, but the fact there are consistent negative comments online regarding this tool, means you should do your research before parting with your hard earned cash. While this made seem like a silly question, no buyers guide can really begin without first clarifying exactly what the tool in question is. 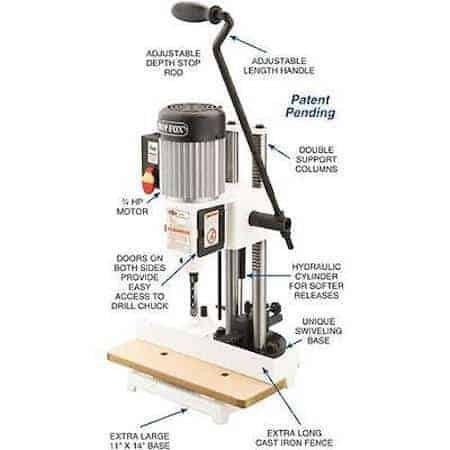 A mortising machine is a specialized and dedicated woodworking tool that is used for cutting square or rectangular mortises, or recesses, into a piece of lumber (timber). They come in 3 main forms, the stand, benchtop or saw mortiser. 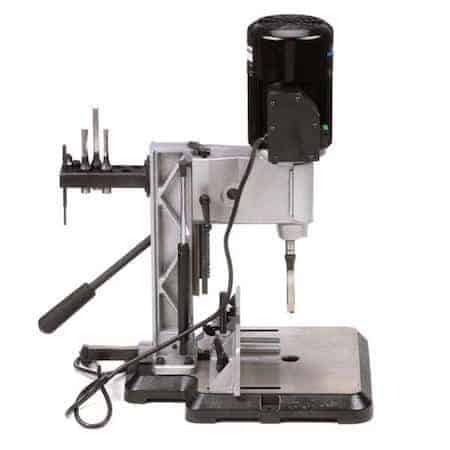 As you may have noticed, for the purposes of this review roundup and buyer’s guide, we have mostly concentrated on dedicated benchtop mortising machines. 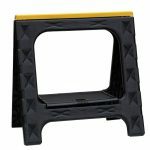 These are more accessible to hobbyists and professionals alike, take up less space than say a stand mortise, and are quiet, safe to use and do not produce a lot of dust. Most importantly they deliver dependable results with minimal set-up time. 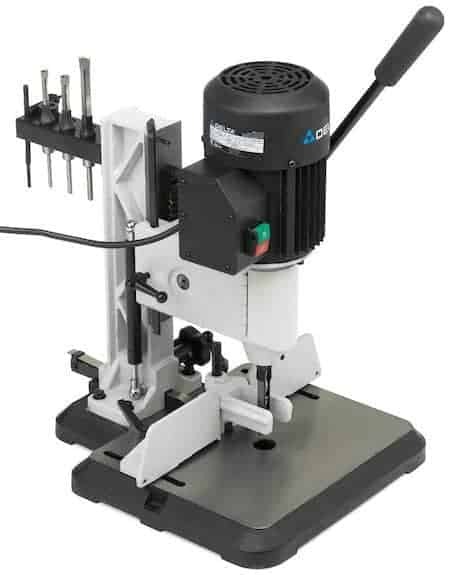 When looking to buy the best mortise machine, a solid reliable tool should be the order of the day. Let's look at some of the key features you need to look for when shopping for a benchtop model. Overall workspace is a very important consideration when buying a benchtop. 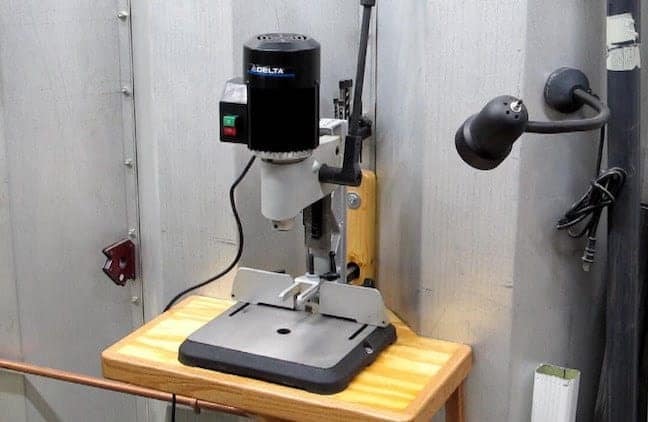 You should aim for a tool with a work surface that will both fit into your shop, while being large enough to support work without the need for alternative rigging from you. 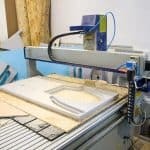 Of course larger projects will need extra support from time to time, however the largest table sized machine you can buy, the better. When it comes to motor amps and RPMs you should ensure that the power under the hood is sufficient enough to cope with all wood types and depths, as well as stand the test of time after extensive use. The majority of benchtop mortiser machines utilise a ½ hp induction motor. 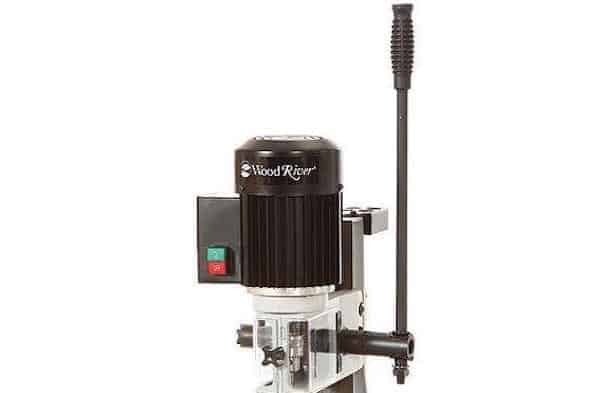 While this is enough power to accommodate most requirements, (the motor in a mortise machine, simply drives an auger bit) the real determining factor lies in the motor RPMs. The faster the bit rotates, there is actually more chance of burning the walls of your mortises with heat build-up. While some mortisers have speed adjustable mechanisms, the majority run at a steady 1700 to 1750 rpms. 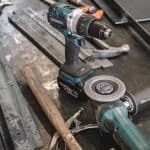 One of the most important factors that will determine the performance of your machine and the results of your work, is the additional tools that are used with it. Here we are talking about chisel capacity and bit changes. While the majority of benchtop models will take up to ½" x ½" mortising chisels, there are some that claim to take as much as ⅝" and ¾" chisels. You should consider these claims alongside the robustness of the mortise machine in question. Benchtop machines are not necessarily designed to force larger chisel sizes into hardwood. You will also want to be able to carry out bit changes with minimum fuss. 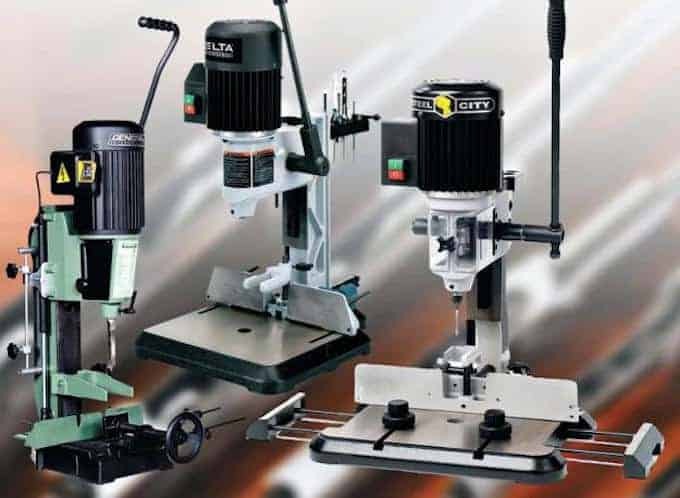 For that you should look for a machine that offers fast and efficient bit changes with as few tools as possible. How Far Does the Head Travel? 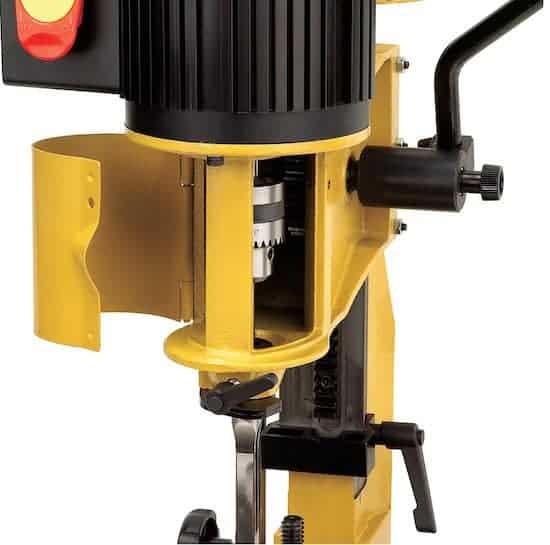 The head travel or 'stroke' of the machine (i.e, how far the bit will travel along a vertical axis when you pull the lever) is another important consideration when buying a mortise machine. Stroke capacities generally range between 4 ¾" to 6". If the head travel is too small under circumstances where the distance to the work piece is large, you will end up needing to jimmy the work piece up in order to be closer to the bit. If time and efficiency are a priority, this is something you will not want to be fiddling around with. How long is the Feed Lever? The feed lever on mortise machines is long. 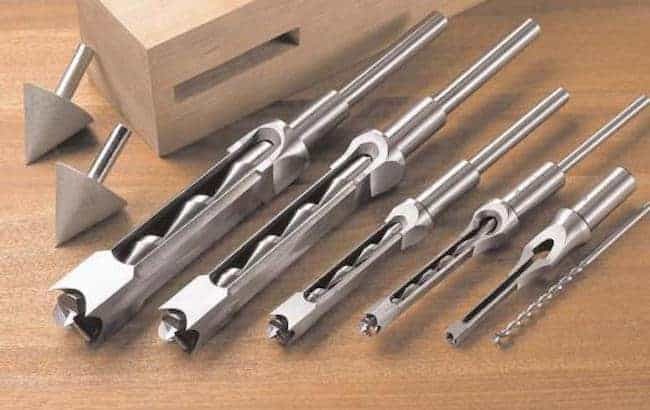 This is to provide the operator with as much leverage as possible when lowering larger diameter bits into the wood. 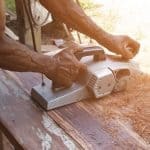 When looking to buy a mortise a long, sturdy feed lever that can be repositioned for different depths of cut should be one of your priorities. The depth stop on your machine of choice should be easy to adjust, should not flex under pressure and above all needs to be accurate. 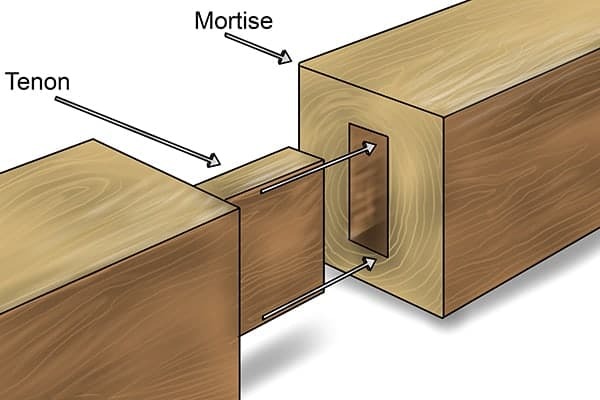 The bottom of your mortise should be at least 1⁄16" deeper than the length of your tenons; if your depth stop is out you could run into problems. When looking to buy a mortise, you need to consider the size of the fence system as the larger it is the better. Look out for a fence that is flat across its face or 90º to the table. These are the ones to go for. 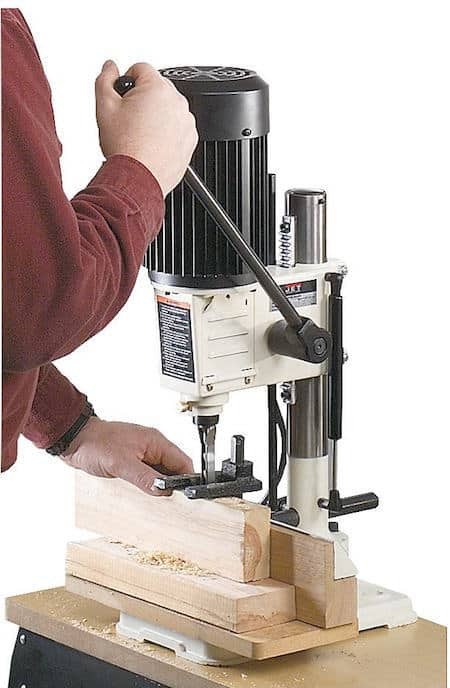 A superior mortise machine will also have a reliable hold-down system. Certain types of wood will require more force to remove the bit. If the hold down system is not up to the job in hand, you could find that your wood will lift off the table. A good system will be thick, strong and completely flat so as to ensure full contact with the wood.